Happily, I received this book as a stock-filler on Christmas day and promptly got stuck into it straight after lunch, by the end of boxing day I had finished it, in more or less two sittings. 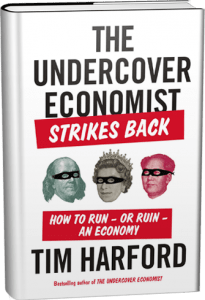 Having read and enjoyed Tim Harford‘s first book The Undercover Economist I was familiar with his chatty easy-to-read style as well as his knack for coming up with really nice intuitive and memorable examples to illustrate fundamental economic principles. His first book was mainly concerned with microeconomics, so I was really keen to see how he turned the same talents to the wider (and arguably bigger) problem of macroeconomics. A word on my perspective in approaching the book, while I work in finance and take a keen interest in economic issues, I have fairly limited academic economics training having studied maths at university. The small amount of economics I have studied came from a single actuarial exam quite a few years ago. I enjoy reading macroeconomic blogs but always feel a little limited in my understanding of them, for example while I broadly understood the difference between a demand-side and supply-side perspective, I would struggle to articulate how either manifested itself in times of recession, and how each would interact with monetary policy. This is what Tim Harford articulates brilliantly in the book. Through the use of two powerful examples: the Washington DC babysitting co-operative, and the PoW camp economy, we see how a carefully-managed increase in the money supply can help a demand-driven recession, while structural reform is the way to address a supply-side slump. Perhaps the biggest benefit of Harford’s microecon0mic background is his ability to avoid being too opinionated or political when it comes to macro theories – something I find happens all too frequently with the more well-known macro commentators. Harford instead illustrates the pros and cons of each approach and when they might be useful, rather than offer specific advice on the current situation. Other chapters I enjoyed included the discussion of ways in which economists are changing their models in response to changing reality, for example being forced to take into account the financial system more accurately, and also take the game theoretic (or “dating”) approach to analyzing job seeking (rather than a simple supply/demand approach). The book was evidently written very recently (in early 2013) so is at its peak relevance now in terms of the application of some of the “learnings” to the current global economic situation. And although it will become less contemporary with the passage of time from this point, the overall examples will still be helpful. The only way I could imagine someone might be disappointed by this book is if you have already studied economics to a high level and retained a lot of that understanding. Then I could see one might say the book doesn’t add much, but for me it has added to my understanding and will help me greatly in the future in following the arguments made on the popular macroeconomics blogs, I would definitely recommend it to anyone coming from a similar position to me.